John Gottman, Ph.D., is Professor Emeritus of Psychology at the University of Washington, where he established what the media called, "The Love Lab," and conducted much of his award-winning research on couple interaction and treatment. Dr. Gottman has studied marriage, couples and parent relationships for nearly four decades. He has authored or co-authored 119 published articles as well as 44 books, including: The Seven Principles for Making Marriage Work, The Relationship Cure, Why Marriages Succeed or Fail, and How You Can Make Yours Last, Raising an Emotionally Intelligent Child: The Heart of Parenting, And Baby Makes Three and The Marriage Clinic. World renown for his work on marital stability and divorce prediction, Dr. Gottman's research has earned him numerous national awards, including: Four five-year-long National Institute of Mental Health Research Scientist Awards; The American Association for Marriage and Family Therapy Distinguished Research Scientist Award; The American Psychological Association Division of Family Psychology Presidential Citation for Outstanding Lifetime Research Contribution; The National Council of Family Relations 1994 Burgess Award for Outstanding Career in Theory and Research. 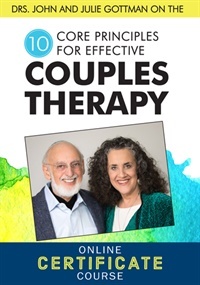 Dr. Gottman, together with his wife, Dr. Julie Schwartz Gottman, is the co-founder of The Gottman Institute, which provides clinical training, workshops, services, and educational materials for mental health professionals, couples, and families. He is also the co-founder and Executive Director of the Relationship Research Institute which has created treatments for couples transitioning to parenthood and couples suffering from minor domestic violence. 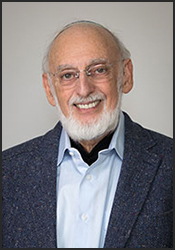 Dr. Gottman has presented hundreds of invited keynote addresses, workshops, and scientific presentations, to avid audiences around the world including Switzerland, Italy, France, England, Israel, Turkey, South Korea, Australia, Canada, Sweden and Norway. 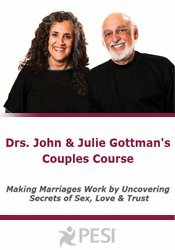 A wonderful story-teller and expert, Dr. Gottman has also appeared on many TV shows, including Good Morning America, Today, CBS Morning News, and Oprah, and he has been written up in numerous print articles, including Newsweek, The New York Times, The Washington Post, Los Angeles Times, Ladies Home Journal, Redbook, Glamour, Woman's Day, Men's Health, People, Self, Reader's Digest, and Psychology Today. Drs. 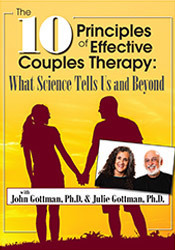 John and Julie Gottman currently live on Orcas Island, near Seattle, Washington. 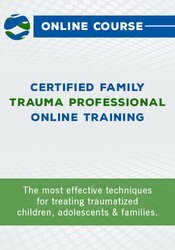 They conduct weekly and intensive couples therapy sessions, provide small group retreats, teach workshops and clinical trainings and give presentations and training workshops around the world.